Once you’ve decided it’s the right time to learn to drive, the next step is choosing what type of vehicle type you’ll learn in. You can choose to learn in either a manual or an automatic car and there are differences between the two, that can affect the speed at which your lessons progress. Manual cars have three pedals; an accelerator, a brake and a clutch, while automatic cars have just two, an accelerator and a break pedal. In a manual car you have to manually change gears to match the speed at which you are travelling at, while this is automatically done for you in an automatic car. There is no restriction on who can or can’t take automatic driving lessons, however there are some individuals who may be better suited to learning to drive in an automatic car than others. Individuals who are slightly older often find automatic lessons to be much easier, while people who struggle with their coordination or suffer extreme nervousness when driving, also tend to be better suited to automatic driving lessons. Over the past few years, demand for automatic driving lessons has increased and there are several reasons as to why lessons of this nature have increased in popularity. Learning to drive in a manual car can be very challenging and a large percentage of the complexity lies in figuring out how the pedals and gears relate to each other. Changing gears to match the road situation is a concept that can often take new learners quite some time to grasp and during your driving lessons this will often be referred to as coordination. It’s not uncommon for new learners to spend their first five lessons working on their coordination and this is a problem which does not exist when you learn in an automatic car. Gear changes are handled automatically in automatic cars and this means that your first few driving lessons can be dedicated to moving the car and dealing with different road situations, instead of learning about the relationship between the pedals. Individuals who learn in an automatic car tend to progress at a much faster rate than those who learn in a manual car. You spend less time working on your coordination and things like clutch control and this means those who take automatic lessons often find themselves at test standard far quicker than those who choose to learn in a manual car. One of the hardest things about learning to drive is mastering maneuvers. There are several maneuvers that you are required to know and maneuvers are a concept that new learners often struggle with. Having to focus on your coordination while executing a maneuver can be a challenge and this is something that Automatic cars make much easier, as they have a gear named ‘Park’, which controls the speed of the car during a maneuver, making it a far easier process to manage. Learning to drive on busy roads can be tricky. There are potential hazards at every turn and there are several different types of roads users on each road, meaning you’re constantly adjusting your speed as the road situation changes. The stop start nature of busy roads places a lot of strain on your body and mind when you’re driving a manual car, as you’re constantly adjusting and because of this, automatic cars are often better suited to these types of roads. How Much Does An Automatic Driving Lesson Cost? 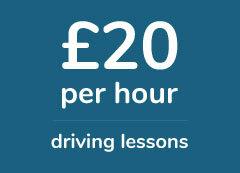 The average price of an automatic driving lessons is £26, £6 higher than average cost of a manual lesson. At first, it can be somewhat confusing as to why there’s such a big difference between the two, however there are two main reasons why this price difference exists. Automatic cars cost more than their manual counterparts and thus, instructors feel they need to charge more for automatic lessons to see a return on their investment. Learner drivers also need a fewer amount of lessons to get themselves up to test standard when they choose to learn in an automatic car, therefore in order to see the same revenue per learner, instructors need to charge a slightly higher rate for automatic lessons, to make up for lower number of lessons that a student will need. As automatic lessons are more expensive than standard lessons, people spend a lot of time looking for cheap automatic driving lessons and there are tips you can use to get the best price on automatic driving lessons. Shopping around is certainly very important and it’s possible to get a good deal if you patiently search for instructors in your local area. You should also ask friends and family who learnt to drive with automatic driving lessons for a recommendation or introduction to their driving instructor, as you can often get a discount on your lessons when you’re referred by a previous student of theirs. Although automatic driving lessons have several advantages, excluding the fact they are more expensive than manual lessons, there’s one big disadvantage to learning to drive in an automatic car. Once you pass your test in an automatic car, you’re license only permits you to drive an automatic car. If you drive a manual car while only holding an automatic driving license, you’e effectively breaking the law and this could lead to accruing points, or losing your license altogether. This restriction does not apply to individuals who pass their test in manual cars, as they are allowed to operate both a manual and an automatic car under their license.